View More In Shed Door Hardware. 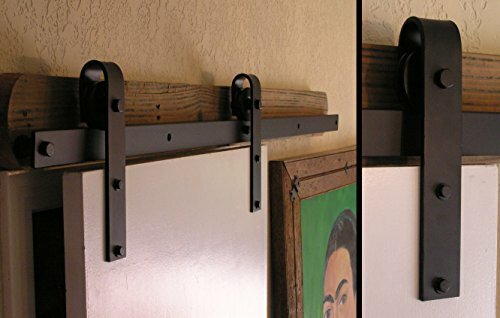 The RH001 is a complete Hanging Door Rolling Hardware Kit containing pre-drilled Flat Track and all other components needed for a single door installation. Kit components are made from hammered iron and powder coated in 01-Flat Black. The Door Hangers have straight cutoffs at the bottom of the Hanger for a slightly more contemporary look.---------------------------------------------- Track Set Includes. 1ea. 96 in. Rail 1pr. Basic wheel and hanger assembly with fasteners.. 6ea. Wall stand-offs with mounting lag screws.. 1pr. Anti-jump blocks with mounting screws.. 2ea. End stops with foam bumpers.. 2ea. Door bottom stabilizer with anchors mounting screws. -------------------------------------- Dimension - 96 L x 12 H in.. Size - 3 in.Product Finish Color - Flat Black.